Fantasy Basketball Index - A Real World Approach by Air Resistance Technologies, Inc.
Long or Short by Several Inches. Basketball VMI tracks these changes for every team, every game day, and displays a team index for your analysis. 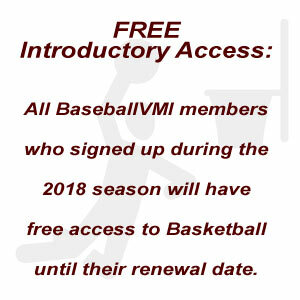 BasketballVMI provides you with a daily index a day or more ahead of game-time so that you can identify performance issues for teams and individuals. The "Team VMI's" listed within our reports identify changes in the shooters' "feel" to launch a basketball the precise distance to make the shot. See https://www.noahbasketball.com/ for analysis of the "perfect shot." If a perimeter shooter misses, or makes more shots than normal for him, the rebounders from both teams may be affected by greater or fewer opportunities to increase their scores, as well. By adding our index to your formulas, you will soon be able to identify certain teams, players and VMI's that give you an advantage no one else has. Changes in Barometric Pressure Cause the Shot to be Long or Short by Several Inches, Until the Shooters Adjust to the Venue Conditions. A minus index number such as minus 2.5 means the perimeter shooters on this team will tend to shoot a little short in today's game. A larger index number, such as a minus 10.25 means a shot will tend to be shorter yet. A plus index number, such as a plus 5.0 means the perimeter shooters on this team will tend to shoot long in today's game. A larger index number, such as a plus 15.0 means a perimeter shot will tend to be longer yet. Some players will adjust during pre-game and half-time warm-ups which may allow them early success. However, under the tension of game conditions, may revert to their normal shooting later in the game.